Summer is heating up around here, and so are all the backyard parties that we've been invited to. Annie can't help but make two or three things to bring to these parties - she loves to cook, dontcha know - and one of her more popular desserts is this Es Teler (pronounced "ice tell-UR"). We posted a teaser about this cool Indonesian dessert last year. Es teler is a very simple dish to make, as long as you have an Asian grocery nearby. Most of the ingredients to making Es teler are found in the canned fruit aisle. 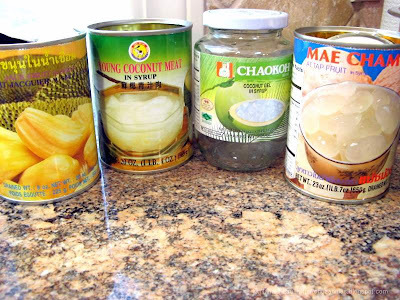 These include two cans of jackfruit, plus a can of young coconut meat, a jar of coconut gel cubes, and a can of attap (nipah palm) fruit. 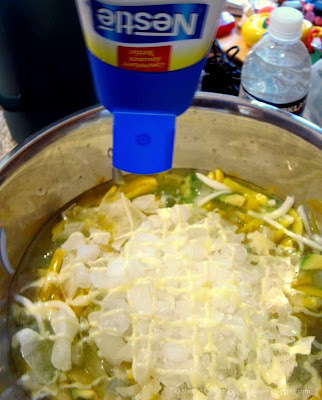 You will also need a couple of fresh avocados, some crushed ice, and some condensed milk (more on that later). 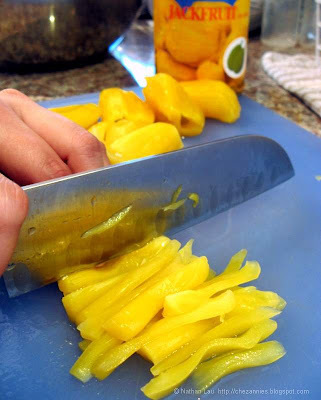 Step 1: Drain the cans of jackfruit and cut the fruit into strips about 1/4 inch in width. 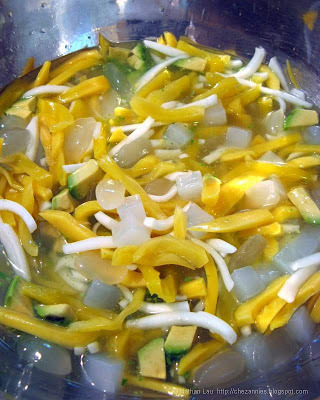 Add the jackfruit strips to a large bowl. 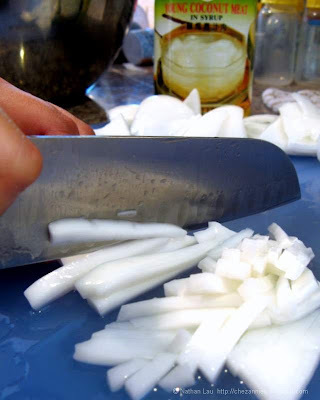 Step 2: Drain the can of young coconut meat (reserving the syrup) and cut the coconut into thin strips of 1/4 inch in width. Add the coconut strips to the bowl with the jackfruit. Add the reserved coconut syrup to the bowl as well. Step 3: Open the can of attap fruit and add the fruit plus half the syrup to the bowl with the jackfruit and coconut strips. 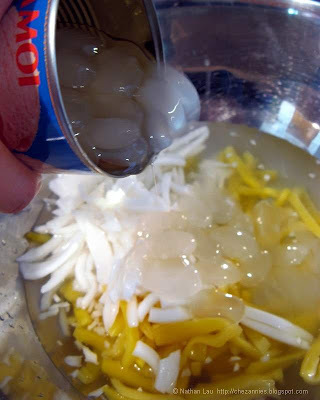 Step 4: Drain the jar of coconut gel and add the gel cubes to the bowl with the other ingredients. 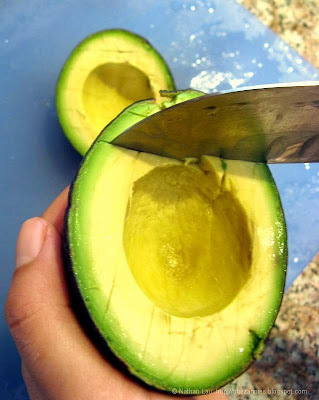 Step 5: Halve the avocados, remove the pits, and cut them into a 1/2 inch dice. Scoop out the diced avocadoes into the bowl with the other fruit. Step 6: Gently mix everything to combine. Step 7: At this point, you have a big bowl of room temperature fruit - not too appetizing, especially on a hot day. 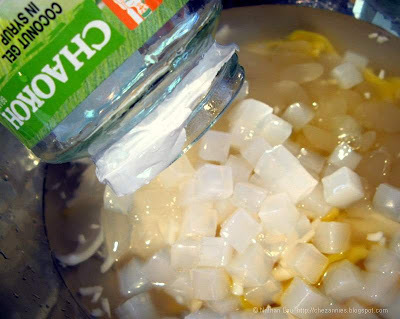 Add several cups of crushed ice to the bowl to cool things down a bit. Step 8: The ice will dilute the sweetness of the fruit. To bring some of that sweetness quotient back to the es teler, add 5 to 8 tablespoons of sweetened condensed milk to the bowl. Start with a little condensed milk, stir it in gently, and taste and add more condensed milk until the es teler reaches your desired sweetness. 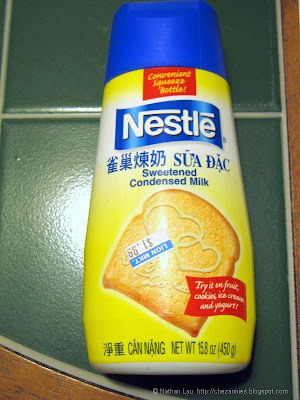 The condensed milk I grew up with always came in a little can. When we used it, we'd have to open the top of the can, spoon out however much we needed, and then replace the top and put the unused can of condensed milk back in the fridge. Every so often, I'd sneak into the fridge and lift a spoonful of condensed milk out of the can for a quick, sweet treat. The thick milk would slowly melt back into a smooth pool, erasing the evidence of my surreptitious tasting. Step 9: Ladle out the es teler into individual cups or bowls, making sure each one gets some of everything. I can't say which individual component I like best about es teler. Each fruit contributes its own unique and pleasant character to the whole dessert. All I know is, we never have any leftovers, but we always have requests for the es teler recipe. So, to all you es teler lovers out there, here you go! Mansi - try it, I'm sure you'll like it! Beautiful! What a lovely thing to take to a party. Do you ever make any with the sago pearls in it too? @sweetrosie - no, we've not made it with tapioca pearls...that's a great idea! BTW, my Indonesian friend told me that "teler" means "blur". Like, the dessert is so mixed-up with all kinds of fruit that it becomes "blur". Hahaha, I couldn't tell if he was serious though. @Leech - welcome, and thanks for stopping by! We'll be making more of these desserts in the future. Another one of my favorites! I could spend all day on your blog :) I don't usually enjoy treats like this until I go visit my mom, but now I'll be able to make it at home. Thanks for the recipe! I am Indonesian and have never thought of making es teler from the canned stuffs here! Thanks for the tips. And thanks for the invite on foodbuzz. @Sharon - I'm pleased that you find our blog good enough to come back to. 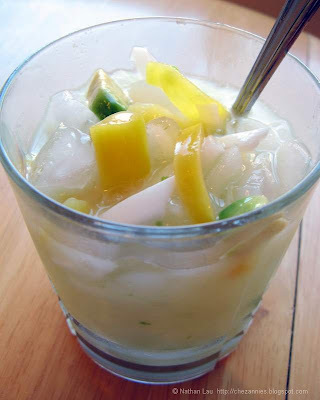 Hope you enjoy the es teler - it's really good when it's hot out. @venny - welcome to our blog! Are you actually in Indonesia, or away? yum! i like the 'sneak a taste' portion for the condensed milk- and i thought i was the only guilty one! This dessert looks awesome..am going to try it.. and I loved the cream scones too..you have a graet blog with awesome recipes..
@sowmya - thanks for the compliements! Hope everyone likes the dish. @indonesia eats - thanks, glad you like it! This is my favorite desert, and my number 1 choice where ever I go. Love...Love your website! Can't get enough except some of the ingredients I may not able to get them from Melbourne....keep all the good works going forever! @Josephine - I'm sure there's an Asian grocery somewhere in Melbourne where you can find these ingredients. Love your recipes and step-by-steps. The Es Teler looks great. Do you have a recipe for making it as a Smoothie? I hear that Es Teler Smoothies are all the rage in SE Asia.